Home Nutrition and Diet Is Corn a Vegetable? Corn remains a common topic in the news and media. With subsidies for corn production and farming, the health effects of corn and high fructose corn syrup have been brought into question. In addition to these concerns, there is an excellent question involving the classification of corn. The state of New York plans on making corn into their state vegetable, but there is still a question about whether corn actually could be considered a vegetable. Hopefully, this dispute will be different from the case of the tomato where the Supreme Court had to rule on whether tomatoes were vegetables or fruits for the tariff to be set. Is Corn Classified As a Vegetable? Botanically, corn is not a vegetable. It is technically considered a grain because of the origins of the fruit and the way that it is used. When deciding between a fruit or vegetable, you have to first look at the portion of the plant that is used. A fruit is technically any ovary that carries seeds and helps to reproduce the plant. This may include apples, cucumbers or tomatoes botanically. Due to this, corn could be considered a fruit because each kernel encases a seed and is the ovary of the plant. Of course, the real world is far different than botany. When it comes to diet and traditional uses, corn would technically be classified as a vegetable or a grain. According to the United States Department of Agriculture and the Whole Grains Council, corn is beyond just a food. It is used to make items like glue, cosmetics, ink, ethanol, medication and fabrics. In the United States alone, there are 80 million acres of land that are devoted to corn production. This is, in part, the reason why corn is the top produced food item in the world. Since it is subsidized in the United States, more corn is produced than is actually used for eating. Due to this, corn is often present in other foods like food sweeteners, cooking oils, starch, high fructose corn syrup and beverages. At present, 20 percent of the world’s food is provided from corn. In addition, it is often fed to livestock and pets because corn is so cheap to produce. The human body needs fiber in order to operate. It helps to keep your blood sugar levels stable and helps to speed the release of fat and cholesterol from the body. This aspect of your diet is important for losing weight because it helps you to feel satiated for a long time after eating it. In addition, fiber can help to prevent constipation and lower your cholesterol. Each day, women are supposed to have 20 grams of fiber and men are recommended to have 30 grams. 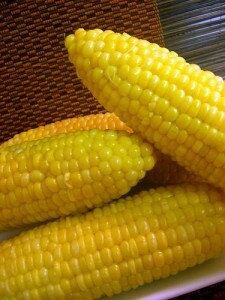 One cup of sweet corn provides about 3.5 grams. Vitamin A is necessary in your diet because it helps your vision, the lungs and connective tissues. Beyond this, it is also an antioxidant that helps your body to fight the free radicals that cause cancer and aging. Women are supposed to have 2,000 international units and men are intended to have 3,000 units of vitamin A every day. One cup of sweet corn contains 310 units. Despite the popularity of the no-fat diet craze of the 1990s, your body needs fat to function. Protein and fat help to repair muscles and provide energy to your brain. Women are recommended to have 46 grams of protein a gay, while men need to have 56 grams of protein. 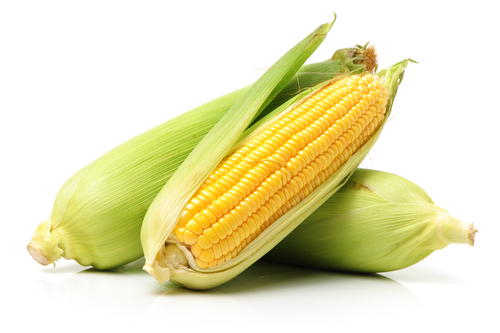 A cup of sweet corn contains 5 grams, which helps to add protein to your diet without having to rely solely on meat. It is not a significant source of fat though, so you would need to get your daily fat intake from another source. Each day, you are supposed to have 4.7grams of potassium. This nutrient helps your heart, muscles and bones to function and become stronger. A cup of corn contains 330 milligrams, so it can supplement your normal potassium intake. Although corn can be healthy as a vegetable, it is not good to eat alternative forms of corn like high fructose corn syrup on a regular basis. Although corn contains calories, carbohydrates, protein and vitamin A, it lacks many of the nutrients that you need to have in your daily diet. Since corn also increases blood sugar levels due to the 15 grams of carbohydrates in every cup, diabetic individuals should make sure not to consume too much corn. Corn is a vegetable, according to dietary classifications. It is considered to be a starchy vegetable like potatoes, peas and beans. Like most foods, it should be eaten in moderation as a supplement to a healthy diet.